A huge problem in the cosplay community is harassment: some people see cosplayers and assume that because they're dressed up, they no longer get a say in what happens to their body. Hence, some cosplayers have horror stories about being inappropriately touched or verbally abused, particularly those that dress "provocatively." I presented cosplayers with a wipe off board, simply reading “Cosplay =/= Consent” and asked them about their experiences of harassment. I was not surprised to hear many horrible stories from women and men alike. These can be as seemingly harmless and annoying as not asking for permission before taking a picture or bothering them for a picture or interview while they were taking a water or food break. But the majority of the stories were more serious and ranged from threats of violence to inappropriate touching, and from lewd facebook messages to stalking. Nonetheless 16BitSirens hope to expand the project so that others can participate and raise awareness on the issue. 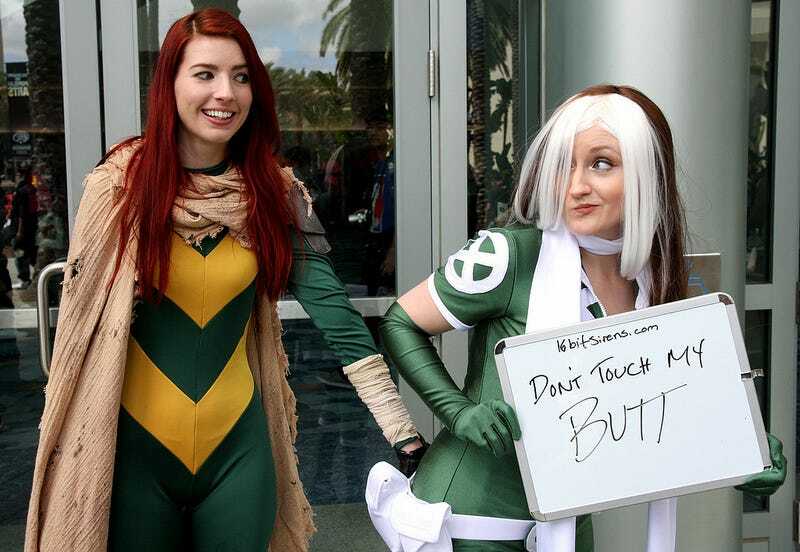 Whether or not you are a cosplayer, you can contribute a picture of yourself holding a sign that says Cosplay =/= Consent or anything else you feel is appropriate to convey your feelings. Additionally, whenever you are at a convention and catch someone in the act of taking a sneaky, unauthorized photo of a cosplayer, please snap a photo of them and submit it under #CaughtCreep. You can submit via Facebook (tagging our page in the photo,) on Instagram, Twitter, or Tumblr with the tag #CONsent, or directly to us via email. If you are a photographer or organization who would like to gather many photos and contribute, please contact us about setting up a joint gallery and the materials necessary to make it happen at various events. Here are a few images from the project, though you can view all the ones they've collected over at Flickr.